With Mother’s Day approaching, now is the time for families to plan how they are going to treat their loved ones. A trip to the Isle of Wight makes the perfect gift, offering mothers and their families the chance to get away from it all and enjoy some of the Island’s best features. From treating them to foodie delights to exploring the great outdoors together, there’s something for every mum on the Isle of Wight. Anyone looking for a grand gesture should look no further than The Royal Hotel’s Mother’s Day Dine & Stay offer. For just £180 for two people, guests can enjoy a one-night stay in one of the hotel’s stylish rooms, a three course dinner in their two AA Rosette restaurant, a full English breakfast and a complimentary floral arrangement. Situated in the town of Ventnor, the hotel is just a few minutes’ walk from the pretty seafront, filled with cafés and ice cream parlours. Ventnor is one of Britain’s most famous Victorian health resorts due to its unique micro-climate, so it’s the perfect place to spend a relaxing Mother’s Day weekend. The Royal is also offering tempting deals on Mother’s Day lunch, afternoon tea and dinner. Details of all the Mother’s Day offers and how to book can be found at: https://royalhoteliow.co.uk/offers. The Needles Rocks are one of the Island’s best-known landmarks and they create a stunning backdrop for a delicious afternoon tea. The Needles Old Battery is serving a special celebratory afternoon tea on 31st March from 10:30 until 16:00, with the set menu at just £15 per person (admission charges apply). The menu includes a selection of cakes, sandwiches and scones, all served with tea or coffee. The quaint team-room will take visitors back to the 1940s with its décor and, paired with the breath-taking views of the Needles, there’s no better place to tuck into a tasty treat. Families can give mums a pampering this Mother’s Day with a trip to the Liz Earle store in Ryde. The well-known beauty brand has its roots on the Isle of Wight, so visitors are sure to get five-star treatment in the Union Street store. With complimentary skincare consultations and mini treatments on offer, it’s a wonderful way to enjoy quality time together this Mother’s Day. For added relaxation, families can book a special treatment such as a massage or facial for their loved ones. The full range of Liz Earle products is also available to purchase in-store, making it the best place to pick up a last-minute gift for that special someone. 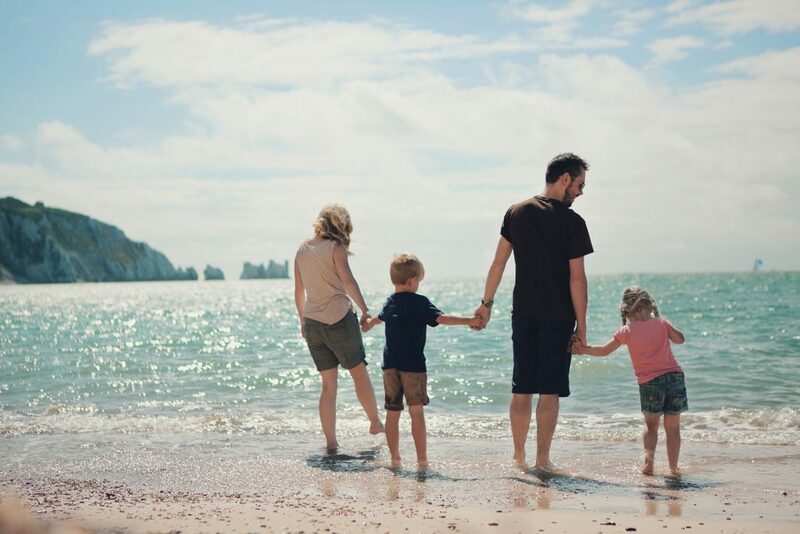 Half of the Isle of Wight is protected as an Area of Outstanding Natural Beauty, making it the ideal location to enjoy a day out as a family this Mother’s Day. From rugged coastal paths to enchanting forest trails and magnificent beaches, the Island has a variety of landscapes that can be explored in a number of ways. There are plenty of walking routes available, from gentle strolls to harder clifftop hikes, as well as specially designed routes that include a historical element, such as the Dinosaur Safari, or those perfect for four-legged friends. Visitors can use Wightlink’s useful guide to decide on the best route based on difficulty, distance and type of walk. Another one of the Island’s most popular activities is cycling. Wightlink allows foot passengers to bring their bikes for free, or visitors can even hire bikes on the Island. Most cycling routes are off-road, making them safe for a family ride, but there are also opportunities for road-cycling and mountain biking. Cycling is a great way to take in the sights of the Island, with routes passing through charming villages and country lanes as well as coastal paths with spectacular views out to sea. No matter which route is chosen, there are always spots to stop for a drink and bite to eat to help energise riders for the next stint of their journey. A trip to the Isle of Wight is the ultimate day trip or longer stay getaway for mothers and families this Mother’s Day, with endless options when it comes to spoiling them. Wightlink offers crossings to the Island in as little as 22 minutes for foot passengers, or 40 minutes on the car ferry, so there’s no better way to get to the Island to enjoy quality time together. Prices start from £51 for a day return for a family of four (based on crossings out at 10:00 and returning at 20:00).